After announcing plans to launch the UK’s first National Disability Museum, a number of retailers across the UK have offered antique mobility aids to the project. In addition, the British Healthcare Trades Association (BHTA) announcing its full support of the initiative. Dave Thompson MBE DL, Co-Founder and CEO of Warrington Disability Partnership & Disability Trading Company, told THIIS at the start of 2019 that the charity was planning to create a national, pan-disability museum. Putting out the call to companies, charities, associations and individuals for interesting artefacts to tell educate and share the remarkable history of disability and funding to bring the idea to life, Dave Thompson says the project is now building real pace, with generous parties offering unique pieces of equipment to feature in the museum. Colin Struthers, owner of Edinburgh-based, family-owned retailer Med-Ecosse, has offered a number of vintage mobility aids to the National Disability Museum says Dave, whilst John Sargent from Country Lifestyles Mobility in Kent also offered a range of equipment. Pieces offered by the Kent mobility specialists include an Invacar P70 invalid carriage, A B.E.C Bambino electric child’s chair, 1982 Vessa Vittesse, two Epic power chairs as supplied by the NHS from 1960s to 1980s, a model 9G, a Carters wooden manual chair produced from 1850 to 1950 and various old manuals and books. In addition, the project has received backing from a number of organisations keen to turn the Museum vision into a reality, including the Culture Board for Warrington declaring its 100 percent support of the development. The Board is now working with Warrington Disability Partnership to drive the strategic planning of the project, including working with curators of Warrington’s local museum to help put together the collection and holding discussions with the Art Council. The BHTA has also pledged to provide its full support to the initiative, with Andrew Stevenson, interim Director General of British Healthcare Trades Association, noting the opportunity the Museum to raise awareness and understanding of the industry as a whole. “A National Disability Museum will really help to shine a spotlight on the tremendous amount of innovation, research and development that has taken place in the sector over many years and is an initiative that the BHTA is fully supporting,” he told THIIS. 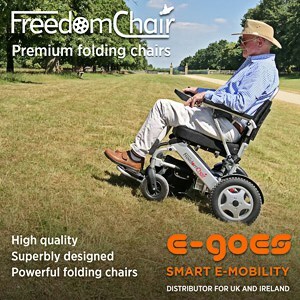 “It is an opportunity to educate people about the wide array of disabilities in our society today and raise awareness of some of the ingenious solutions that have been designed by our members to give people back their mobility and independence, as well as vastly improving the quality of lives for millions. Recently, Dave Thompson highlighted plans to introduce a ‘Design and Development Hub’ to the facility, allowing the museum to not only reveal technology of the past but also help shape and improve the innovations of the future.